Coir coconut fiber is recognized by The Food and Agriculture Organization of the United Nations as the thickest and most resistant of all commercial natural fibers. Recognized for its low decomposition rate (which leads to long product life spans) and high strength, coir fibers and coir erosion control products are considered the most environmentally-friendly choice for restoration and landscaping projects. Typical coir erosion control products, like coir wattles and logs, consist coir twine netting and are filled with coir mattress. With any project, the first question that should be asked before choosing products is: What problem needs to be solved? From wattles to silt checks, there are many coir erosion control products that provide a wide range of restoration solutions. 1. Restoring an environmentally sensitive area. 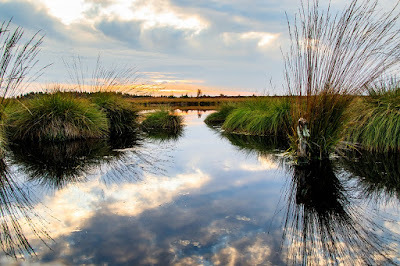 The title of “environmentally sensitive” has been used to define landscape elements (such as riverbanks, wetlands, wildlife habitat areas, and steep slopes) that are vital to biological diversity, water, soil, or other natural resources. These areas require stabilization and soil amendment in a way that encourages future erosion control through plant seedlings. For this, an erosion control blanket, also known as an erosion control mat, would be a viable option. Once installed, a coir blanket requires little maintenance and ample opportunity for plant seedlings to take root and defend against erosion. 2. Adding consistent, stable height to any shoreline. Working to develop height on slopes, hills, banks, inlets, and soil lifts can be a challenge without the right products to ensure the amount of strength and stability required. The rectangular shape and layered design of coir erosion control blocks makes them a perfect long-lasting choice for any shoreline, slope, or riverbank. Available in both 12- and 16-inch block heights, the coir blocks can be easily connected at each end to meet the needs of any length erosion control project. Coir blocks biodegrade over 2-5 years and improve seed germination. This allows the site to grow and protect itself as time passes. 3. Filtering sediment while also reducing water flow. When looking to keep sediment out of streams, channels, drainage ditches, and other areas that could be affected by site runoff, it’s important to control more than just what runs through the water. A check dam can generally be described as a small erosion control barrier made of any material from rocks to coir fiber, and serves the primary purpose of reducing the velocity of flowing water. An environmentally-friendly check dam constructed with coir is called a silt check, which includes a coir wattle and coir mat. Entirely biodegradable, silt checks are installed once and require no removal. The bottom matting that is added provides support for both upstream to prevent undercutting, and downstream to retain silt. 4. Protecting drains from construction site runoff. When construction sites get to work, they may not realize how much runoff can flow into unchecked local storm drains or curb inlets and damage our ecosystem. 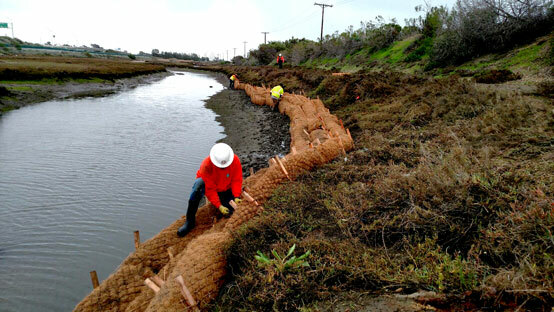 For these types of projects, an erosion control coir wattle is the best line of defense. Designed similarly to a log, coir wattles are less dense and smaller in diameter, making it easy to place them in front of drains. Their ability to retain sediment, silt, and sand, while still allowing water to drain through, is a huge benefit. In fact, an entire drainage system can be designed with coconut coir wattles, as they allow for faster filtration in areas with high flows, and prevent pooling or flooding around drains. 5. Managing weeds and supporting vegetation growth in landscaping. Keeping harmful weeds away from otherwise beautiful landscaping is a full-time job, but it can be made easier with right products. Coir weed mats are needle-punctured pads of thick mattress coir, designed to suppress weeds while also encouraging new growth. Easily customizable, coir weed mats can be cut to suit any need. Once placed around trees and plants, they will biodegrade and provide mulch for further growth. Coconut coir is considered by many to be an ideal grow medium, due to its ability to not just retain water exceptionally, but also still promote good drainage and aeration. Not only that, but it is also optimal for growth because it is closer than the traditional peat moss to a neutral pH. 6. Bank stabilization and support. Some of the worst erosion has occurred to rivers, wetlands, and streams due to steep slopes and exposure to strong waves and currents. The products chosen to restore the area should add to the health of the environment and encourage future growth to strengthen the banks. 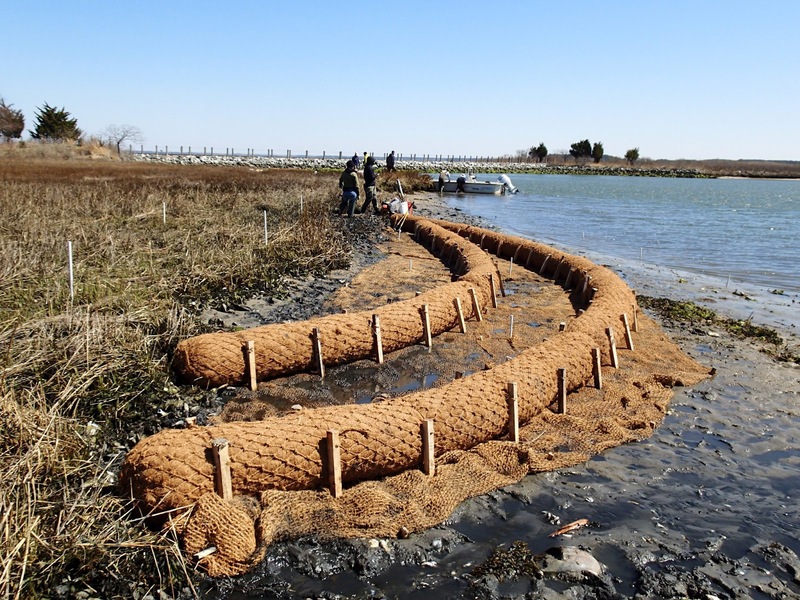 Coir logs, a strong and flexible coir erosion control solution, are designed as a natural control area for restoration projects. Coir logs are densely-packed with mattress coir for strength and durability, with a typical lifespan of two to five years. This gives planted seeds plenty of time to deeply root themselves as the logs biodegrade and stabilize the bank. Their structural design also allows them to hold their own against strong breaking waves that would otherwise continue to erode. 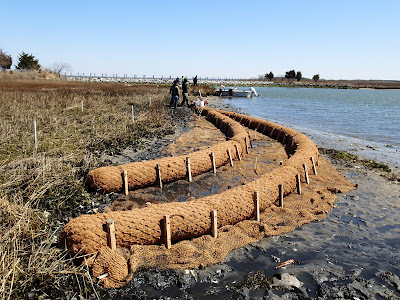 As with many product lines, the family of coir erosion control products can often serve similar purposes depending on the size and scope of the project. While they all share the same goal of filtering harmful sediment and reversing the effects of erosion, there is a perfect choice for every need. 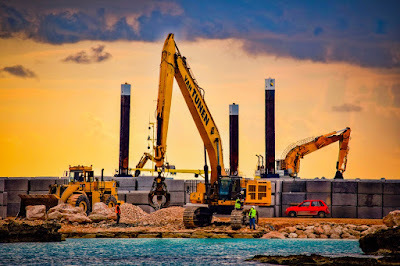 The skilled team at GEI Works is ready to help assess restoration project needs and suggest the best course of action. Contact us today online or by phone at (772) 646-0597 for more information, or to receive a quote.